TBT: The Tams, "What Kind Of Fool Do You Think I Am?" California in the 1960s had the Beach Boys; the East Coast, from Virginia down through the Carolinas and Georgia, had Beach Music. 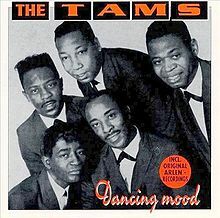 The Tams, from Atlanta, along with Maurice Williams and the Zodiacs, exemplified this easy rolling, party friendly style of rhythm and blues. Two versions of the Tams survive today. I was born in Evanston, Illinois on February 17, 1937. My mother, Karla Seifer Grossinger, had, in her seventh month, been hospitalized for observation. The pregnancy, her first, was not going well. My father, Max, had been admitted to a separate wing ten days earlier with a second heart attack. She overheard two nurses speaking outside her door. "Isn't it a shame that Mr. Grossinger is dying." My mother told me this story when I was six years old; it was one of the rare times she ever mentioned my father. She begged the nurses to let her see him but was warned she might lose the baby if she left her bed. Two minutes later they picked her up from the floor. My heartbeat was undetectable, and a caesarean section was performed, ostensibly to bring out a dead fetus. From this inauspicious beginning came a woman who would, over the course of her life, become friends with Jackie Robinson and Betty Friedan, and have meaningful encounters with John F. Kennedy, Hugh Hefner, Ayn Rand (who played a joke on her), and Johnny Carson, among others. Details are in her book; my review is here.